There are many ways to maintain a beautiful and healthy lawn or garden without harming yourself, your kids, or the natural world. Read on to discover tips for a lush healthy lawn or garden. Most people living near Bear Creek take pride in having an attractive yard and garden. Residents spend hours mowing lawns, planting shrubs and trees, and weeding to make sure everything is healthy and attractive. Maintaining vegetation keeps soil in place and prevents rain from washing it into streams and rivers. Lawns, compared to paved areas, are also helpful in catching rainwater and allowing it to evaporate or soak into the soil. By simply keeping up on your landscape maintenance can be a good start to protecting creeks and rivers. The most common ways people accidentally impact creeks and rivers are by letting pollutants enter the storm drain by applying too much water, fertilizer, and pesticides. Fertilizers are helpful while establishing a lawn, but if over-applied, water washes the nutrients from the lawn into streams where it causes excess algae growth and affects water quality. The chemicals in fertilizer kill fish, and can even be harmful to kids playing in or near the water. Growing a Stream Smart lawn is surprisingly easy! Just follow the simple tips described below for mowing, mulching, proper clean-up, watering, and weeding. Mow High: Grass that is about 3 inches tall shades out weed seeds, grows deeper roots, and better absorbs and filters rainfall. 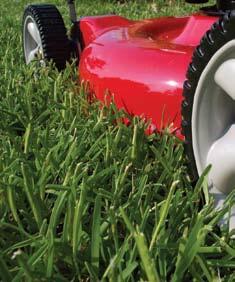 To be Stream Smart, set your mower at three inches. As an added benefit, taller grass is more resilient to drought as deeper roots enable the plant to find water and nutrients. 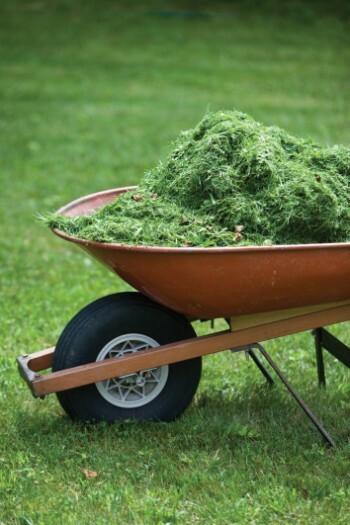 Mulch Clippings: For a naturally healthy lawn, you can also try mulching your lawn clippings, either by using a mulching mower or by leaving the clippings on the lawn. The extra organic material helps your lawn retain moisture and provides nutrients back to the grass as free fertilizer. You can also mulch leaves that fall on your lawn using your lawn mower. Leaves will break down over the winter and enrich the soil, saving you money on fertilizer next year. Use the Right Fertilizer in the Right Place: If you are going to apply chemical fertilizer, always read labels carefully and use chemicals in the recommended amounts. For mature grass, always choose a lawn fertilizer that is phosphorus-free, unless a soil test shows that you need to add more of this nutrient back into your soil. Generally, only new grass plants require additional phosphorus for initial root growth. If your lawn looks pale or sparse, apply some slow-release fertilizer (you can find organic ones at your local nursery) when you over-seed. If your lawn borders water, do not mow or fertilize to the water’s edge. Create a buffer zone with uncut grass or other vegetation to prevent soil erosion. Clean Up: Storm sewers carry water directly into creeks and rivers. Never dispose of clippings or pet wastes in or around sewers or water resources, such as streams, rivers, and lakes. Make it a habit to sweep up any fertilizer, grass clippings, and leaves. This will help keep nutrients out of waterways. Also, be sure to cover your soil, including piles of landscaping materials. Whenever you are doing a construction or landscaping project, take care to prevent soil or mulch from entering a storm drain. Even substances we think of as “natural” contribute to water pollution. Even simple changes in how you maintain your lawn or garden can make a big difference to water quality of the streams. For example, did you know grass clippings piled up beside the road, or tossed into an irrigation ditch or creek, can be harmful to water quality? By disposing of lawn waste properly, either in the green lawn waste bins, a recycling facility, a closed lawn waste bag, or by composting, you can prevent the nutrients from accidentally polluting our streams. Water: When it comes to water, more is not always better. Try installing efficient irrigation systems, like drip, or adding a rain sensor to your timer. These installations will save water and protect your lawn. Removing turf and converting even some of your lawn to water-wise plantings, or native plants, can actually reduce costs, maintenance, and water use, while adding to the aesthetic beauty of the yard. For more information, check out our Watering to Protect Stream Water Quality page. Use only natural herbicides. By applying corn gluten in the spring before germination, you’ll prevent some noxious weeds like dandelions. Hand-pull weeds after it rains. Pour boiling water over weeds to make pulling easier. Industrial vinegar is another natural herbicide. To prevent further weed growth after pulling them out, try aerating and over seeding with site-appropriate mixes to crowd out weeds without herbicides. In gardens, practice companion planting with complementary plants close together. Complementary planting can help fight diseases, control pests, and improve the soil. The most Stream Smart thing to do is to replace some or all lawn areas with useful features such as decks, or other plants that are less thirsty and require less fertilizer. An additional bonus is that these other options typically require less maintenance, saving time as well as money. Another option is to try going grass-free with ground covers, eco-lawns, or naturescaping, which drastically reduces the need for fertilizer, water, and work. Note: Much of this information is from the Willamette Valley. Therefore, the overall information provided is helpful and relevant, but some recommendations are not applicable to the Rogue Valley due to our hotter and drier summer season.